The Arado aircraft company arose quietly under restrictions, but it soon became a solid presence in Germany. Dr. Jorg Armin Kranzhoff's excellent new book Arado: History of an Aircraft Company (Schiffer Military History, 1997, $35) fills a void in aviation literature and establishes a standard for other publishers. The author, obviously both a historian and an aviation enthusiast, brings to life the story of a company whose products were always aesthetically pleasing but about which little has been written in the United States. The Arado firm's final product is also its most widely known, the lovely Ar-234 jet reconnaissance and bomber plane. Yet over the years, the company produced dozens of excellent aircraft. When World War II ended, Arado had a number of very advanced airplanes on the drawing boards, including radical jet fighters and bombers. Kranzhoff takes a deliberate, linear, chronological approach that follows the Arado story from its 1914 roots in Germany's Warnemunde naval facility all the way to its dissolution after World War II. Originally published in German, the book has been translated into excellent English. If there is a drawback, it is that some illustrations of letters and technical documents appear untranslated, and usually with just a tantalizing caption to spur the reader's interest. The fact that it is a single-manufacturer book invites immediate comparison to the justly praised Putnam series. While the Putnam series of books provides more detail about each individual aircraft, Kranzhoff manages to integrate the story of the aircraft with the story of the factory, including its political and business atmosphere. In the best of both worlds, the Putnam books would have more of this sort of material, while Kranzhoff would provide an appendix with expanded technical material on the aircraft. The Arado Flugzeugwerke GmbH was officially formed in 1925, when the German aviation industry was still forced to operate covertly because of the provisions of the Versailles treaty. The name Arado, which means "plow" in Spanish, was a cover term used by a predecessor company to disguise illegal deliveries to South American countries. The firm's active role in aviation began when Heinrich Lubbe invested in the firm. Lubbe was a record-setting pilot in the prewar years and a collaborator with Anthony Fokker on aircraft armament during World War I. He not only worked on the famous Fokker interrupter gear that allowed machine guns to fire through the propeller arc without damage but also created a 12-barrel machine gun for aircraft use. After the war, Lubbe was deeply involved in a number of clandestine activities involving weapons development. Lubbe obtained the services of engineer Walter Rethel for the new firm, and the first design produced was the Arado SI trainer, an attractive if conventional biplane. A series of trainers followed, but in 1926, when the Allies lifted some of the limitations on German aircraft construction, Arado began to build fighters that looked like a cross between a Fokker D.VII and a Gloster Gnatsnapper. The Ar-65E was the first equipment of the newly announced Jagdgeschwader 132 "Richthofen," and it was described as fast and delightful to fly. Arado also launched into the transport field, a highly competitive arena in postwar Germany. The small firm's ability to spread itself so widely was fostered by subsidies from the Weimar Republic, which had begun its own rearmament program long before the Nazis arrived on the scene. The company was reorganized in 1931 with an entirely new administration, headed by World War I ace Walter Blume, who had scored 28 victories and earned the Pour le Mérite. When the Nazis took over in 1933, the German aviation industry was inundated with funds–Arado alone received almost 6 million Reichsmarks in contracts. From that point on, the firm grew rapidly, and by 1938, it employed more than 14,000 people–about five times Lockheed's employment at the time. Arado supplied a series of excellent trainers and fighters that were fundamental in establishing the Luftwaffe as a powerful military and political entity. From 1935 on, however, the firm was brought under close control by the German government, as aviation firms were first nationalized so that they could be "rationalized" for the production effort. Lubbe resisted the takeover and was arrested and forced to sell his company to the Reich. Arado had delivered more than 1,500 aircraft, including license-built Heinkel He-51s, by 1936. It had not progressed technologically as rapidly as some other companies, and its designs were for a time confined to traditional construction methods. Nonetheless, it produced the distinguished Ar-196 seaplane and the classic Ar-96 trainer, an all-metal, cantilever low-wing aircraft that brought the firm into the realm of modern construction techniques. Some 12,000 Ar-96s were produced, ranking it well up on the German aircraft production list. The final section of the book is devoted to one of the most beautiful, efficient and respected aircraft of the war, the sensational Arado Ar-234 jet. Intended originally for a reconnaissance role, it was developed into a bomber as well. The author takes us behind the scenes to glimpse the creation, production and employment of this aircraft, and also shows us the amazing developments that might have come from it had the war permitted. 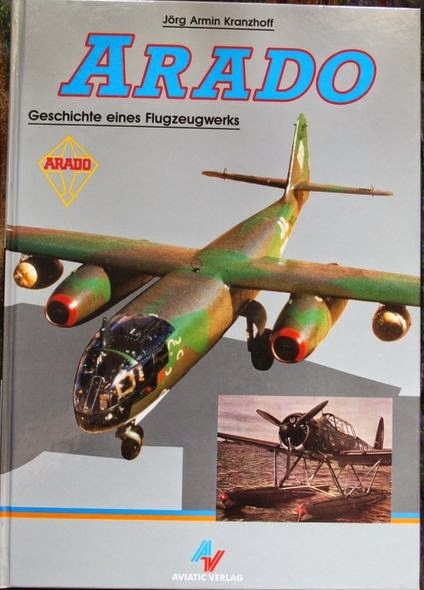 Arado: History of an Aircraft Company is a great reference book and a fascinating read, for it shows clearly how the history of aviation is far more than a catalog of top speeds and wingspans. At the heart of any aviation story are the men and women who made it happen, and Arado is a prime example of just how fascinating the human element can be.